An 11-year-old boy had headache and diplopia for distal objects for 3 months. He developed gradually progressive ptosis of left eye and right hemiparesis for 1 month prior to presentation. He was brought in status epilepticus to emergency department. Magnetic resonance imaging (MRI) scan of the brain revealed an extra-axial mass, measuring 8.9 × 6.6 × 5.7 cm lobulated, attached to the cavernous sinus. It had completely encased the cavernous part of left internal carotid artery. The mass had grown superiorly compressing the overlying brain, ipsilateral lateral ventricle, and the left cerebral peduncle. On T1-weighted images, the mass appeared iso- to hypointense to cortical gray matter [Figure 1]a. On T2-weighted images, the mass had heterogeneous intensity with cystic changes and areas of hypointensities. In contrast, the mass showed intense heterogeneous enhancement with multiple flow-voids. There was hydrocephalus with shift of midline to the right [Figure 1]b-e. On fluid attenuation inversion recovery (FLAIR), the mass was isointense with the gray matter [Figure 1]f. The patient was subjected to left temporobasal craniotomy. In the middle fossa, the tumor was entirely within the dural covering of the cavernous sinus, and widened Meckel's cave. Tumor was highly vascular and heterogeneous in consistency with areas of necrosis. The tumor became intradural into the posterior fossa after coming out of Meckel's cave with arachnoid capsule surrounding it. The posterior fossa component of the tumor was removed after cutting tentorium posterior to the trochlear nerve. The tumor in relationship with the brainstem was covered by a relatively thick arachnoid membrane, making the tumor resection relatively safe. The trigeminal nerve was displaced along the lateral dome of the tumor. Skull base repair was done using the locally available temporalis muscle, fat, and fascia lata grafts harvested from right thigh. Unfortunately, patient had stormy postoperative course with pneumonitis and septicemia. He expired due to septicemia after two days. Histopathology showed sheets of plump spindloid cells and dilated gaping stag horn vasculature with anaplastic cells and foci of necrosis, consistent with the diagnosis of anaplastic hemangiopericytoma [Figure 2]a and b.
Anaplastic hemangiopericytoma should be considered in differential diagnosis of a heterogeneous lesion of cavernous sinus presenting with short duration of symptoms. 1. Auguste LJ, Razack MS, Sako K. Hemangiopericytoma. J Surg Oncol 1982;20:260-4. 2. Bonde VR, Goel A. Two patients with intracavernous haemangiopericytoma. J Clin Neurosci 2009;16:330-3. 3. Chiechi MV, Smirniotopoulos JG, Mena H. Intracranial hemangiopericytomas: MR and CT features. AJNR Am J Neuroradiol 1996;17:1365-71. 4. Atkinson JB, Mahour GH, Isaacs H Jr, Ortega JA. 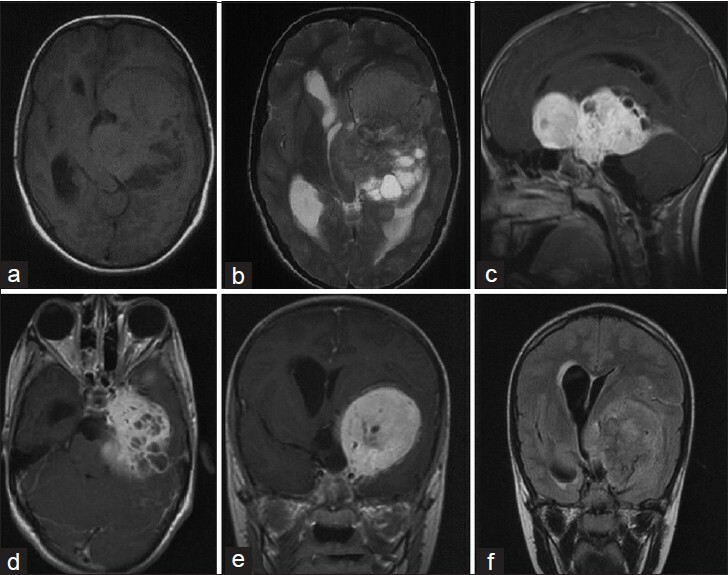 Hemangiopericytoma in infants and children. A report of six patients. Am J Surg 1984;148:372-4.